Using a different structure to the Geneva Colts match day in early November, the organisers opted for a Twenty20 format with four teams of 6-7 players. The winners of the first two would play a final, while the two losing teams would play against each other in a 3rd match. Zurich Crickets opted to bat and openers Ruan K (52*) and Noorkhan A (55*) dominated. ZCCC posted 181 for the loss of just one wicket. However, Basel Dragons chased well and despite losing 4 wickets, three of them to sharp run outs, kept up with the run rate for most of the game with Francis L (28) and James W (76*) playing key roles. Despite a bright start by Lavan S (28) and Wafadar W (26), ZCCC’s Team 2 could not capitalise and were bowled out in the 12th over with Hanaaz Q the pick of the bowlers (4-28-2). 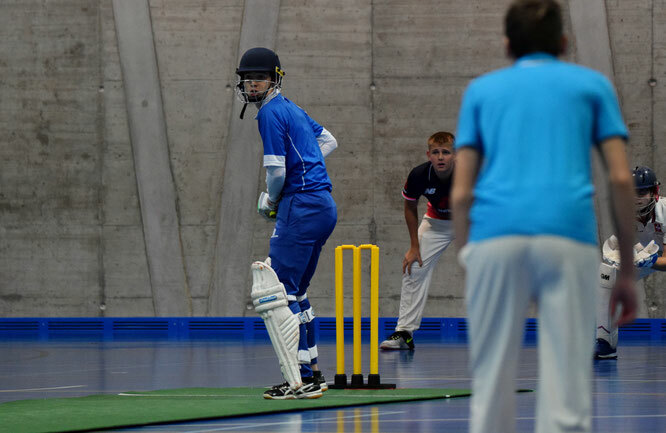 Due to wayward ZCCC Team 2’s bowling the Rest of Switzerland’s batsmen were under little pressure and despite losing 3 wickets cruised home in the 13th over with Nikhil A (16) and Ismail Z (17*) doing most of the damage. A much better team bowling performance (Wafadar 4-21-2) by ZCCC Team 2 managed to restrict Basel Dragons runs and 3 wickets were lost cheaply, but very solid batting by James West (52*) and Anshak M (52*) denied ZC’s Team 2 further wickets. In reply, batsmen came and went all too quickly after making promising starts (Lavan S 11, Wafadar W 14, Surya 17 and Amogh R 15*), and James W (1-6-1) and Ismail Z (1-4-1) wrapped up the proceedings. The in-form ZCCC batsmen ruthlessly exploited anything bowled too short or too full and amassed runs at over 10 an over. Ruan K (48), Noorkhan (45), Khawar A (43*) and Dayn P 19* guaranteed that any chase would very quickly be under huge pressure. The batting display was followed by bowling one: Dayn P (2-18-2), Khawar A (2-19-1), Noorkhan (2-13-2), and Simon H (0.3-1-1) ensured that only one batsman (Aakash G 14) reached double figures and that the innings finished after just 7.3 overs. Many thanks to Basel Dragons’ Ian Lightowlers and Steve West for the organisation of the day and setting everything up for the players.